A LIGHTWEIGHT WING DESIGNED FOR SINGLE-TANK DIVING. OUR TRAVEL SERIES OF WINGS ARE SMALL-PROFILE AND IDEAL FOR TRAVEL AND DIVERS WHO WEAR A MINIMAL AMOUNT OF WEIGHT. At 25lbs/11.3 kg of lift, the Travel can accommodate one 80ft3/12 L tank with no more than 16lbs. of additional weight. 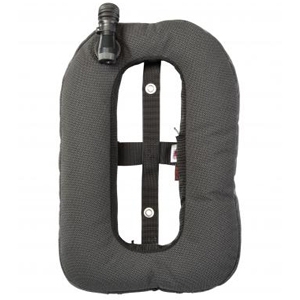 With its donut-shape, the Travel wing provides greater stability and control in the water. 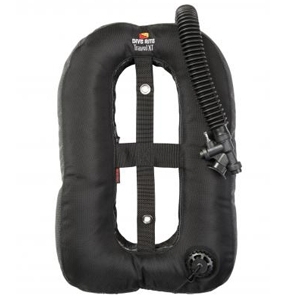 Donut-style or 360 degree wings promote an even volume of inflation on top, sides and bottom, which improves buoyancy control and promotes a more efficient, horizontal trim. 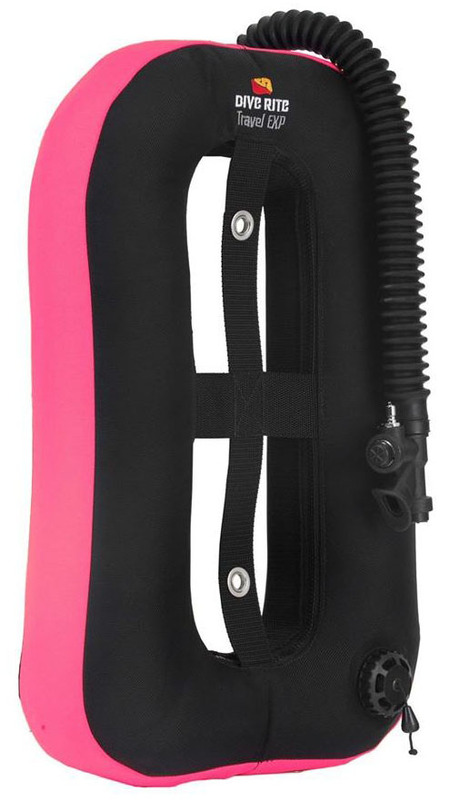 Divers may choose from our durable 1680 ballistic nylon EXP material or our even more rugged SuperFabric® brand technology XT material that creates an armor-clad outer shell that is impervious to damaging pinches and cuts, with a 1680 ballistic nylon diver's side panel. Both the Travel EXP (Model BC 4100) and Travel XT (Model 5100) are further enhanced with a heavy-duty, 210 denier nylon laminated bladder. They are backed by our WORRY-FREE LIFETIME GUARANTEE and are made exclusively in the U.S.A.
TRAVEL EXP ALSO AVAILABLE WITH PINK OR RED SIDE PANELS FOR THE SAME PRICE! BLUE AND ORANGE SIDE PANEL OPTIONS ARE ALSO AVAILABLE BUT MAY TAKE LONGER TO DELIVER. Model BC5100 Travel XT outer bag is made of SuperFabric brand technology outer shell and 1680 ballistic nylon diver's side panel. 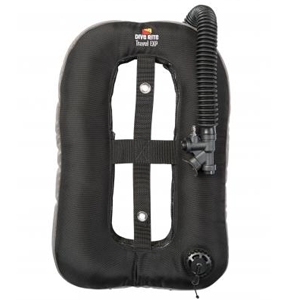 Comes equipped with choice of 16-inch rapid exhaust (pull dump), 16-inch or 12-inch elbow along with either15-inch, 22-inch or 27-inch low pressure inflation hose. A set of marine-grade 316 stainless steel grommet mounting holes are used to attach wing to harness and/or singles mounting plate.